Guarding services aren’t quite the same as they were 10 or 20 years ago. Technology now works as a partner alongside security guards. The two compliment each other perfectly and allow guards to respond faster and stay safer. With the rise of Internet of Things devices, you’ll likely see even more technology being used in conjunction with guard services. While some tech devices are hackable, the impact of technology on security guard services is actually positive. All it takes is the right security plan to mix tech and guards to keep your business more secure. 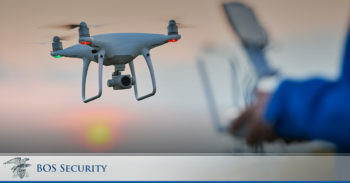 Advanced surveillance systems and drones are making it easier than ever to increase security coverage without having to add more guards. Obviously, you still need guards to respond to any potential security incidents these surveillance options discover. Now, security guards are able to monitor footage, with some systems being so advanced that they automatically recognize potential problems without a physical guard monitoring them. For large businesses or those on a tighter budget, mixing technology with guards boosts security coverage for a safer overall environment. It’s vital for security guards to know immediately if something’s wrong. However, they’re only human and can’t possibly see everything, everywhere. With technology to help monitor wider areas and to notify someone when the wrong door or key card is used, security guards are notified in real-time of potential security threats. Plus, smartphones and smart watches make it easier than ever to get notifications and communicate with each other. Guards are able to call for backup with a tap versus making an actual call. In the past, it was nearly impossible for businesses and security companies to monitor where guards were at all times. Obviously, as a business, you want to make sure the guards are doing their jobs. For security companies, it’s important for us to know that our guards are staying safe. Technology solves both problems. For instance, BOS Security utilizes GPS tracking with RFID tags to keep track of our security guards at all times. We even provide them with handheld units that send out an alert if they’re stationary for a set period. We use these technologies to notify someone that something may be wrong with the guard. For businesses, you’re able to see in real-time that security guards are patrolling or working in specific areas. It’s an accountability step that we take to protect our guards and provide you with peace of mind. Security programs now make it easier to access vulnerabilities in businesses, properties and gated communities. These programs help both you and security companies develop better security strategies. For instance, if you’re experiencing regular issues, simply adding more guards might not be enough. You may need to take additional measures, such as blocking off unused exits or fencing in the parking area and adding better lighting. It’s only when you have a better idea of your vulnerabilities that you’re able to take control and prevent as many security issues as possible. For security companies, technology makes guard management better than it’s ever been. For instance, at BOS Security, we’re able to keep track of all our guards across businesses throughout the country. We’re also able to improve communications and streamline the process to provide the best possible service to our clients. For multi-site businesses, these management benefits extend to you as well. When you have security teams as multiple locations, you need technology to help you manage them. You can quickly see which areas may need additional security and even uncover better ways to deploy guards during busier times. Overall, it’s easier for clients and security companies for ensuring the best security and the right management of security resources. Curious how we utilize technology to improve our security guard services? Don’t hesitate to contact us at 404-793-6965 today for answers to all your questions. We’ll also be happy to help you uncover your own unique security needs. Request our free Security Needs Assessment for more details.